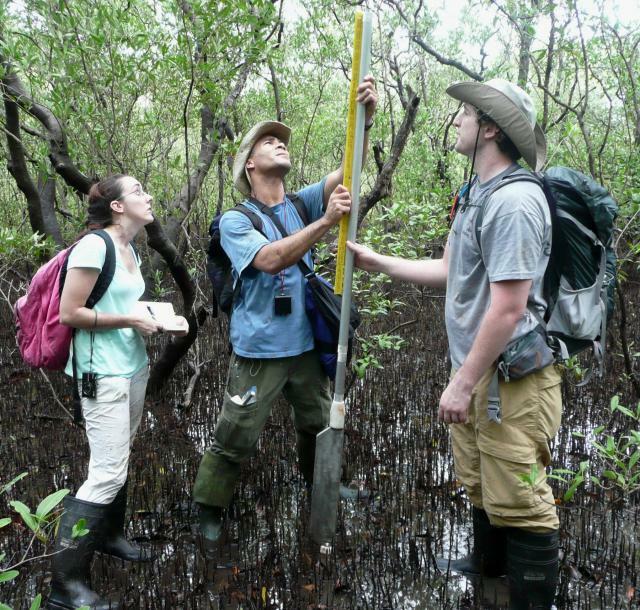 VIMS students shown collecting bog and marsh samples on the Costa Rica Nicoya peninsula. The samples will be dated to help understand the palaeoseismicity of the region. In the image, a Russian peat corer is used to sample peat and other woody plant material. The coring chamber - the wide metal part visible near the water - is pushed into the subsurface. Extension rods, as shown here, can be used to push the corer deeper. When the target depth is reached, a T-handle is used to rotate the entire core assembly 180 degrees. In doing so, a sharp metal edge cuts longitudinally to capture an undisturbed sample of material. The corer is then pulled back up to recover the sample. Image courtesy of Jim Spotila.